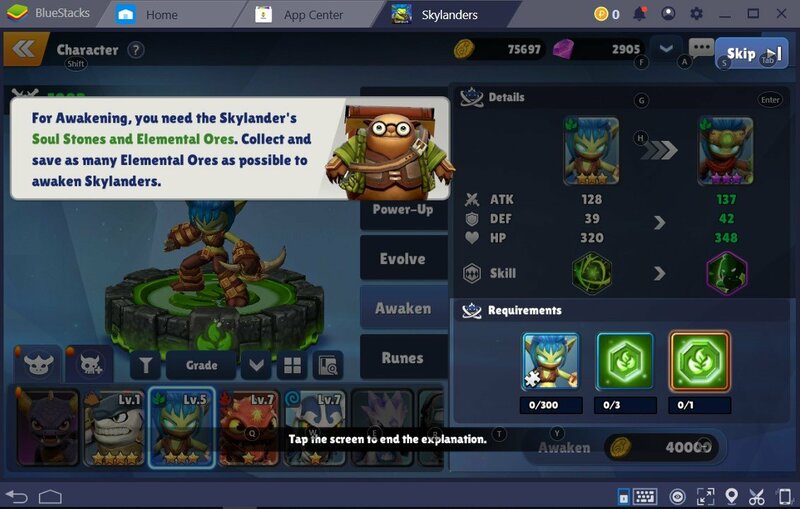 Com2Us’ Skylanders Ring of Heroes has an immersive world and progression system. It offers many Skylanders to recruit and many different requirements to upgrade them to their utmost potential. To cultivate your Skylander, you are going to have to gather the necessary materials. Some materials are easy to gather, while some others require a lot more grinding. As the game progresses, the encounters will become harder and will require more preparation. To overcome the harder battles, you are going to need to master some essential aspects of Skylanders Ring of Heroes. These aspects are elements and improving your Skylanders. Usage of elements is common in RPG games. Knowing the weakness of elements is essential in RPG games. 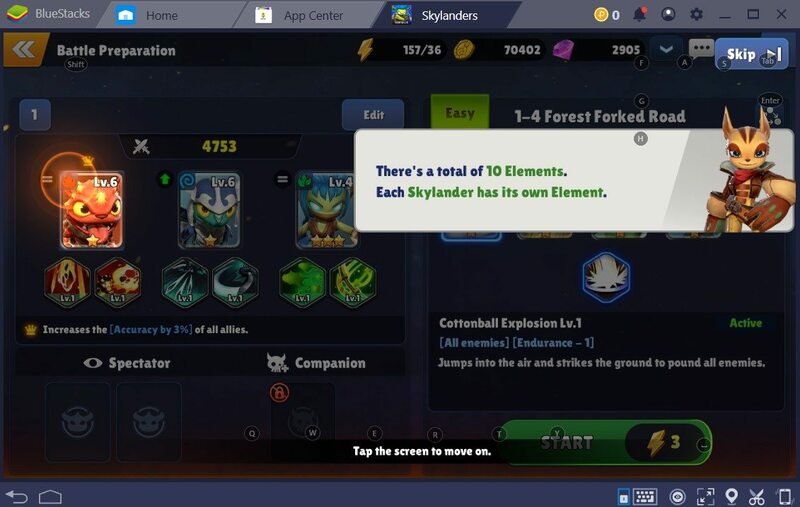 Usually, element factors are quite easy to grasp, however, Skylanders Ring of Heroes pushed the use of elements a little further compared to other RPG games. In Skylanders Ring of Heroes, there are a total of 10 elements. Every element has a weakness. The amount of elements present in Skylanders Ring of Heroes might scare off some players. Don’t worry, you don’t need to memorize any of them. Before the battle starts, you can check the Element Relations chart. Take your time and just take a look at the enemy Skylanders. What are their elements? After your inspection, choose your team accordingly. In the Element Relations Chart, to inspect the element relations, all you need to do is click on the element icon. On the bottom of the chart, you can see the “Weak” and “Strong” sections. 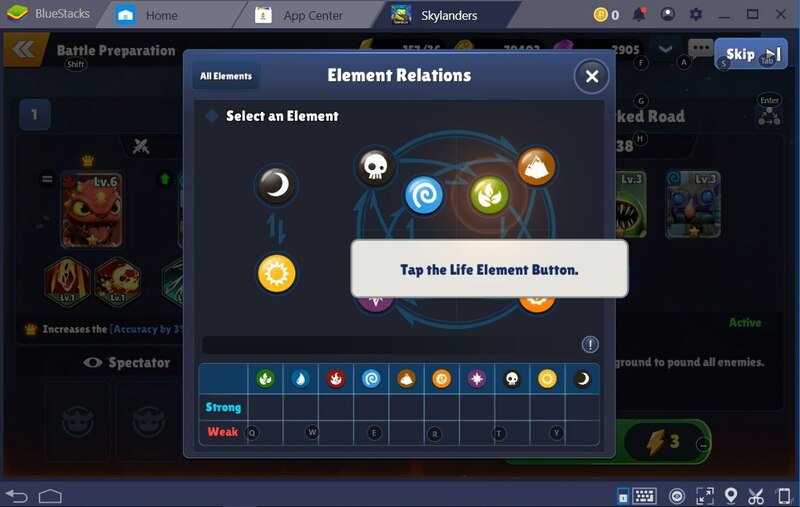 In the early stages of the game, you might just plow your way through with ease, but as the game progresses, you need to choose your Skylanders according to the element relations. Choose the right Skylanders and increase the odds of your victory. 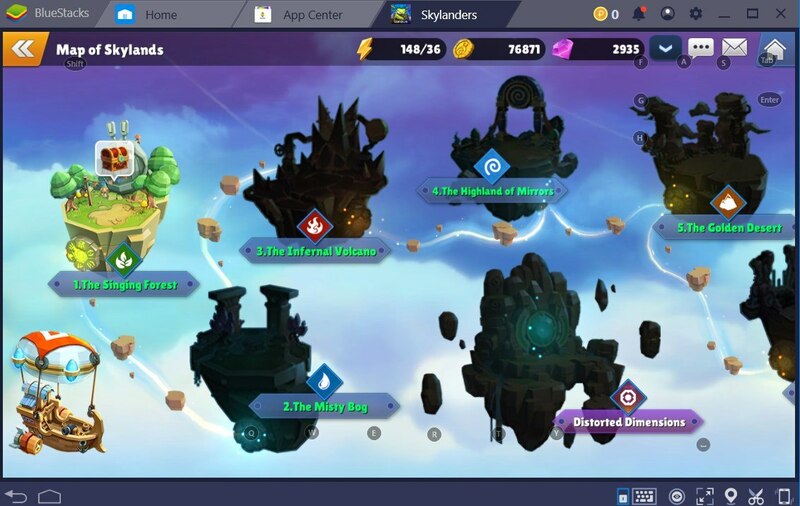 Com2Us offers a very long journey with Skylanders Ring of Heroes. There is a total of ten different world stages associated with the ten elements in the game. By checking the Skylands map, you can prepare your Skylanders team accordingly. Making preparations beforehand is crucial. Every team needs a leader, so do your Skylanders. When fighting a battle, you will have a total of three Skylanders in your command. One of these Skylanders needs to be the leader. 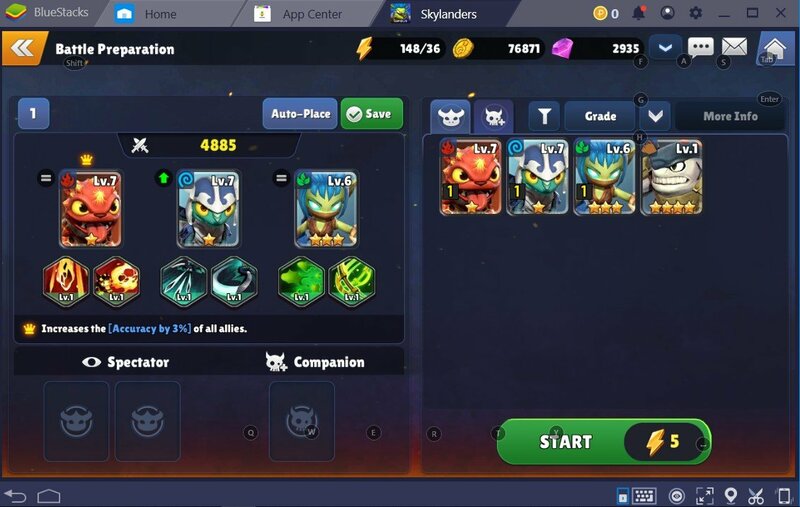 Choosing the right Skylander as the leader is important. Some Skylanders provide your team with a leader skill. Choosing the Skylander with the leader skill provides the team with a passive ability. For instance, the current leader Skylander in our team increases the accuracy of all Skylanders by 3%. Not all Skylanders possess leadership skills. In the early stages of the game, you won’t have much trouble choosing a Skylander as the leader due to most of them not having a leader skill. However, as the game progresses, you will acquire new Skylanders with many unique leadership skills. When this happens, choose wisely and accordingly. Upgrades, getting stronger and better are the essential parts of a well-developed RPG. As the game progresses, you want to see yourself improved and much stronger. Thankfully, Skylanders Ring of Heroes has an upgrade system. You can improve your most beloved Skylanders and push them to their maximum potential. Skylanders Ring of Heroes’ upgrading system can be a little tricky. That’s why we will do our best to explain it in the simplest way. In Skylanders Ring of Heroes, the most crucial upgrade is ‘Evolution’. 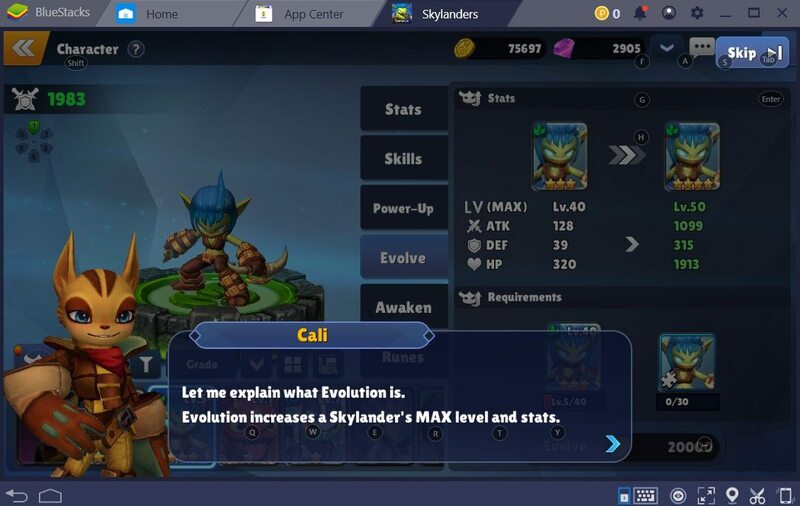 With evolution, you can increase the max stats of your Skylanders and make them very powerful. For Skylanders evolution to happen, first, you need to ‘Power Up’ your Skylander. After a total of five powering up, your Skylander will be ready for Evolution. The most essential upgrade is the Evolution, but there are other sub-upgrades available for your Skylanders. We’ve talked about evolution and power-ups, let’s also take a look at other types of Skylanders Upgrades. You can make the skills of your favorite Skylanders more powerful by upgrading them. To do this, you are going to need elemental ores and upgrade stones. These are not easy to find, so be sure to choose which skill is worth upgrading. Awakening a Skylander makes it stronger and enhances the skill. To do this, you will need high tier elemental ores and soul stones. Another Skylanders improvement factor is leveling up of course. Each of your Skylanders levels up as the game progresses. Just let them battle. More battles mean more experience. In addition to battling, you can level up your Skylanders by using red potions. Red potions can be acquired by advancing in the story mode or by claiming them from your daily login rewards. Let’s recap what we learned about upgrading a Skylander. Evolution: The most powerful upgrade in the game. Make your Skylander extremely strong. Power Up: Improve the stats of your Skylanders. A total of five power-ups are necessary for evolution. 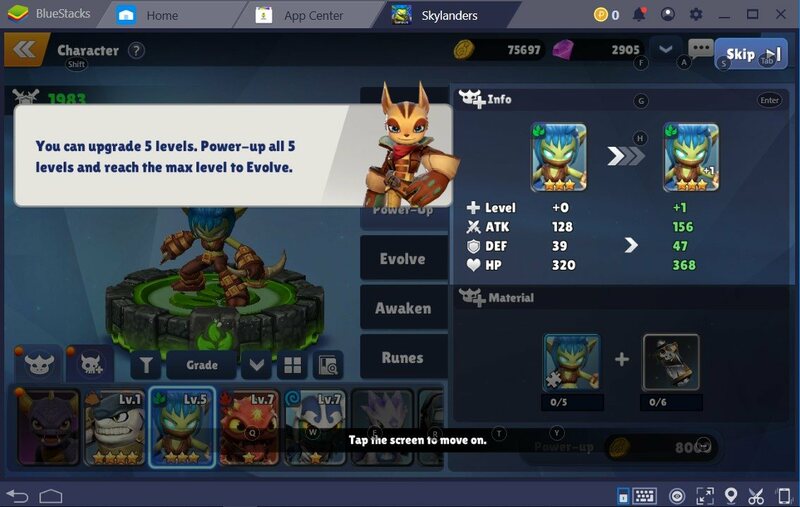 Awaken: Improve the stats and enhance the skills of your Skylanders. Skill Upgrade: Make the skills of your Skylanders stronger. Level Up: Most common improvement for the Skylander. In addition to all these different upgrades, there are also runes present in Skylanders Ring of Heroes. There are a total of ten different runes. Each rune improves a specific stat of your Skylanders. Putting a set of the same type of runes together activates a bonus for your Skylander. 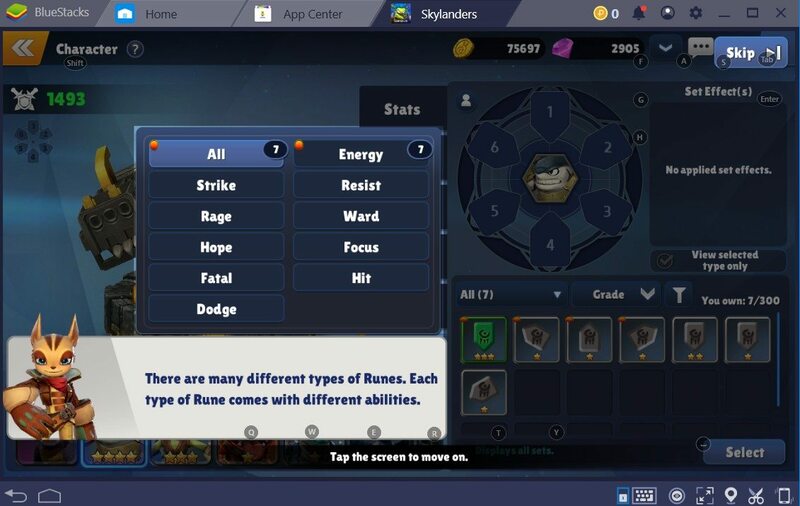 Runes can be acquired as you progress in the story mode. Upgrading your Skylanders accordingly is essential. Elemental ores and soul stones are hard to acquire so use them wisely. Follow these tips and tricks to make your Skylanders the strongest. We hope you found these tips useful and will create the strongest Skylander Army for yourself using them. Have fun and keep playing on BlueStacks.